At this point in my woodworking journey I have been delving more and more into hand tools and frankly falling in love with the sense of craftsmanship and personal connection you have with the piece. That being said, I recently decided to test my theory that with a little practice I could hand cut dovetails more quickly than what it took to setup test, adjust, and cut machine cut dovetails with my PC jig. On top of that, it should be much cleaner and much quieter. So I committed myself to practicing on some scraps every couple of days when I could get some time. I’ve been blogging about this over at Lumberjocks http://lumberjocks.com/doorslammer/blog/series/2315. Up until this point I’ve been using a $25 Crown gentleman’s saw which has worked well and I’ve been fairly successful with it, but I felt like with the straight handle you were never quite sure if you held it the same way every time and the angle of my wrist while sawing felt a bit awkward. So I needed a block plane for another project and have been pining over the Lie-Nielsen low angle for at least a year now so I took the plunge and placed the order. While I was at it I decided I should save on some shipping (all $12 of it) and I ordered the 15 tpi dovetail saw as well. I honed the block plane and have been using it regularly for some of my other projects. I’m quite pleased with it and it’s definitely lived up to the hype. I’ve made some obligatory cuts with the saw, but have yet to cut and dovetails with it, but I can already tell the difference in the balance and ease in which this saw tracks down the line. I’m planning a end table project that should really put this thing to work. 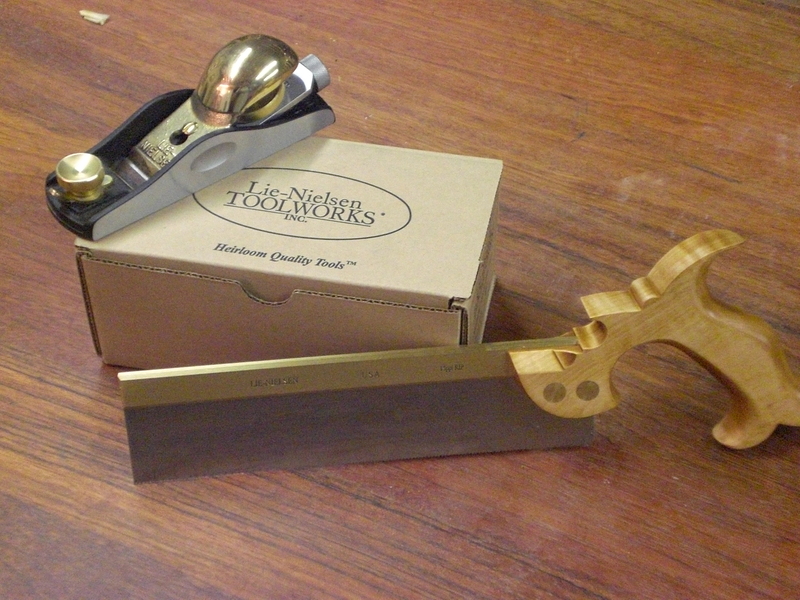 With tools like this, I think my hand tool evolution can only continue to build. ← Does the world really need another woodworking blog?